SKU: N/A. Tags: papers, raw, Raw rolling paper, Raw Rolling Papers, Raw Rolling papers in Santa Barbara, Raw Rolling papers Santa Barbara, rolling papers. The Raw unrefined King Size rolling papers are fantastic products to use with PotValet Cannabis Flower. The papers look brown and are all natural rolling papers displaying a brown color, just like all natural paper should be. Raw papers are good to use with any top shelf Cannabis product from PotValet. Raw rolling papers are all natural products free from any tampering, Gluten Free, chlorine free and Vegan Friendly rolling papers. 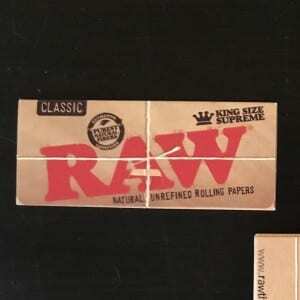 What more could you want from the King Size Raw rolling papers? Raw papers combined with our Top shelf Cannabis strains makes for a fantastic blend. Buy Raw rolling papers in Santa Barbara from PotValet and taste the purity of your herb, when smoking these all natural papers with PotValet weed from our Santa Barbara Marijuana shop. Good! Natural rolling papers, def the best brand around!! !